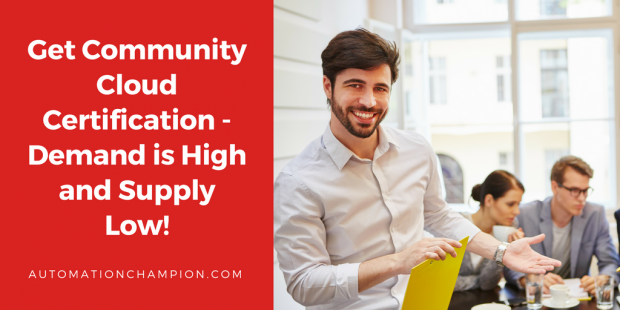 Get Community Cloud Certification – Demand is High and Supply Low! *Disclaimer– Any questions you find in this article are practice questions created by me. Please treat them as pointers – it does not bear any relationship with Salesforce certification examination questions. As a newly minted Community Cloud Certified Consultant, I am sharing my study experiences with you and want you to be the next one to ace it! Along with this certificate, I also cleared Development Lifecycle & Deployment Designer certification! So, get ready and dive in! Personally, I have not come across any documentation to prepare for this exam except Trailhead community cloud module – one of the best learning tools. So, if you are wondering whether the Trailhead module is sufficient to pass the exam then, rest assure that it is – this is my personal opinion. In addition to Trailhead module, I created at least 20+ communities in my developer org while helping people in the Trailblazer community – I actively solved problems other people had with their Community Cloud development requirements; I can not stress enough the importance of this hands-on experience in enabling me to pass the exam! Treat theTrailhead community cloudmodule as a base – or as an introduction to the Community Cloud. To ace the exam, however, there is no substitute for hands-on experience. Compared to Sales and Service Cloud consultant exams, passing Community Cloud certification is not much difficult. Salesforce states that Community Cloud consultant exam is designed for anyone who has experience implementing and consulting on the Salesforce Communities applications in a customer-facing role. The certification is targeted toward the Salesforce Community Cloud Consultant or Partner who wants to Read the rest of this entry!